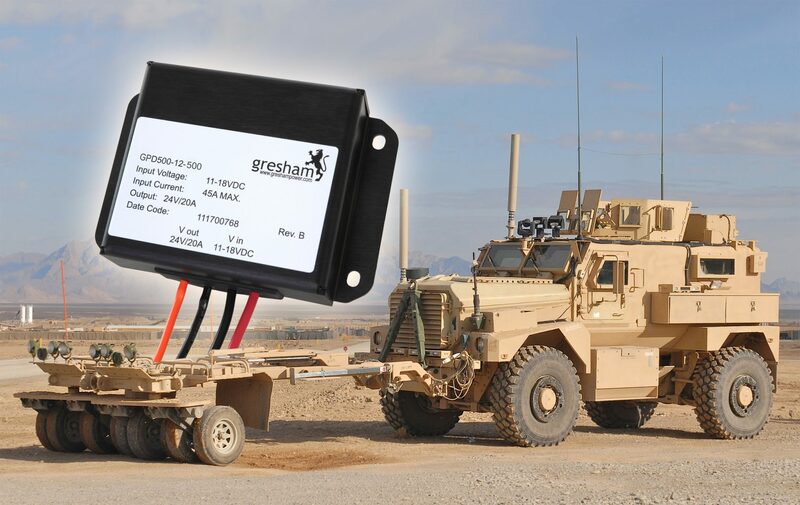 The GPD500 500W DC:DC converter has been designed for use with fixed and mobile communications and security systems on tactical and non-tactical vehicles. Sophisticated electronics developed for military vehicles, is designed to be powered from 24/28VDC and in most cases is unable to operate from the 12VDC electrical systems found on non-tactical vehicles. Instead of making significant changes to the equipment design, this issue is solved by the new GPD500 DC-DC converter from Gresham Power. GPD500 low-profile DC:DC converters have a wide-range DC input voltage from 10 to 20V, feature ultra-high efficiency of typically 96% at full load and can operate over an ambient temperature range of -40° to 70°C. The GPD500 delivers a steady, regulated 24VDC output at 500W and is designed to meet the requirements of MIL-STD 1275D enabling users to swiftly deploy equipment onto vehicle with 12VDC electrical systems. Applications include military, non-tactical, homeland security and recreational vehicles, marine and other rugged environments, mobile broadcast, cellular base-station power, industrial controls, emergency backup power, solar and alternative power systems. Manufactured with fully sealed epoxy resin encapsulation rated to IP67 and meeting MIL-STD-1275A standards the units provide high-reliability operation while withstanding exposure to harsh and complex environments. Dimensions are (L,H,D) 149x27x119mm and weight 750g. The GPD500 power module has a built-in thermal sensing device providing over-temperature shut down with automatic recovery, reverse input protection, current limit protection, short circuit protection, input under-voltage shut down and overvoltage protection. It is also possible to connect several units in parallel to achieve higher power.